Although Islander has taken cake decorating classes from the Wilton headquarters in Illinois, she does not consider herself an expert like the professionals in her local cake club in Texas. But she likes to learn new techniques from the more advanced members and decided to try making a petal cake herself for National Cake Decorating Day. 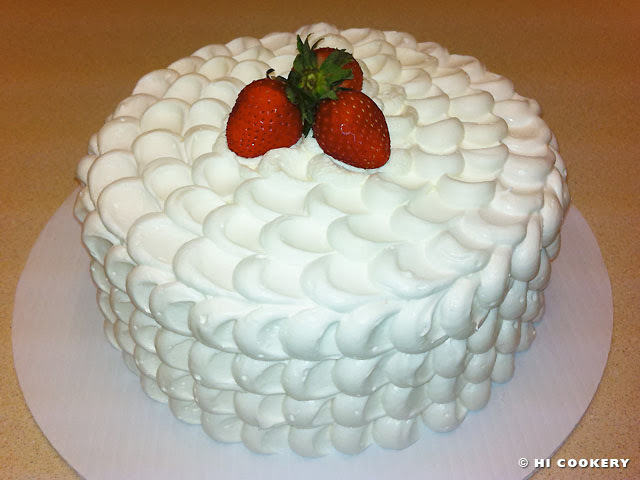 This blog post focuses not on a recipe but on a frosting technique. Islander baked a three-layered cake as a taller display works best to showcase the petals. 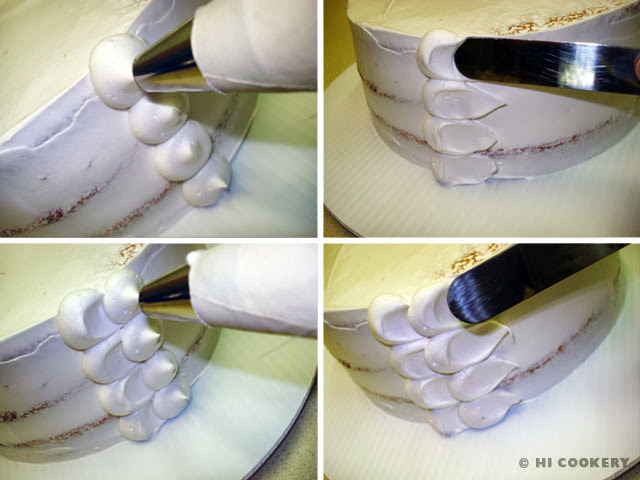 After crumb-coating it, she used a large, round tip to pipe dots down the side of the cake. Then she got into a rhythm of using a spatula to swipe the petal design, piping dots and swiping with the spatula again and finishing the back of the cake with dots. She repeated this technique on the top of the cake, starting from the outside and working her way toward the center. Frosting a layered cake in a petal design is a simple yet impressive way to decorate a cake. 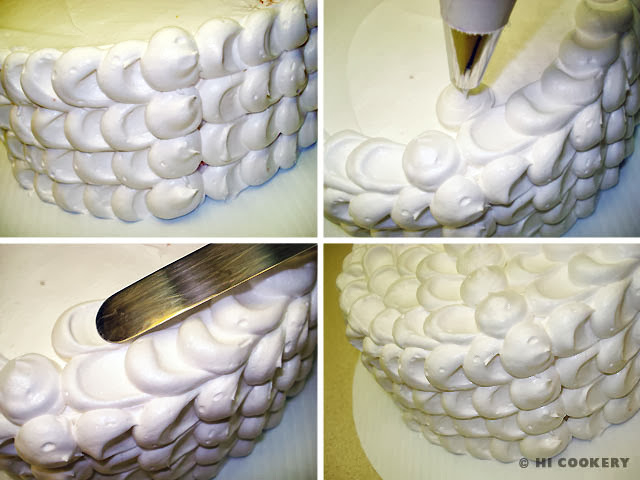 Try this technique for a birthday, anniversary or other special event and especially for National Cake Decorating Day. Frost the cakes and stack the layers. Crumb coat. Refrigerate at least 30 minutes to set. Pipe some dots down the side of the cake using a large round tip. Gently use a spatula to swipe lightly in one direction, wiping the spatula blade clean each time so the frosting does not stick. Move about half an inch over and pipe more dots. Use the spatula to swipe in the same direction as the others. Repeat until the entire side of the cake is done. End the back of the petal sides with dots. Pipe the top of the cake in the same manner, beginning from the outer edge. 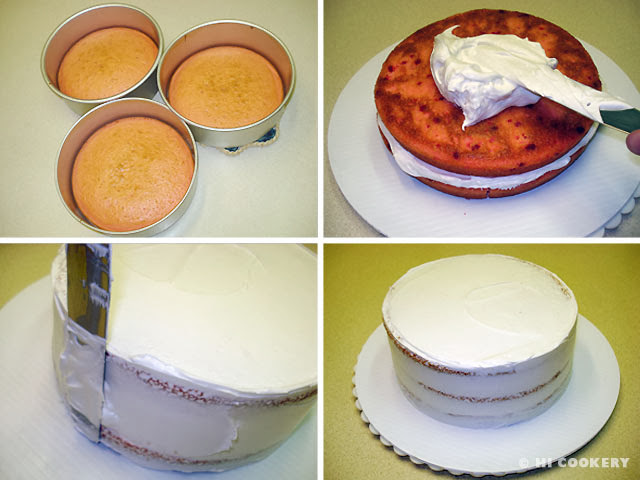 Pipe a dot, swipe it with a spatula, repeat towards the center of the cake and end with a dot in the middle. Refrigerate to set the frosting. Garnish with fresh fruits or candles. For this particular post about our petal cake, we made a strawberry-and-whipped cream cake and topped it with a trio of fresh strawberries. We just used a boxed strawberry cake mix and Cool Whip frosting for something fast and fabulous. For another frosting technique, try decorating a layered cake with rosettes. See our photo tutorial here.